WALLOPS ISLAND, Va. — As if saying “Enough!”, Orbital ATK‘s newly upgraded Antares 230 launch vehicle leaped off of the Mid-Atlantic Regional Spaceport’s Pad 0A at 7:45 p.m. EDT (23:45 GMT) on Monday, Oct. 17, and into the black Virginia night. The mission marked the pivotal return-to-flight for the medium-class launcher and heralded the arrival of new experiments to the International Space Station. The S.S. Alan Poindexter will now travel to the orbiting lab, ferrying some 5,100 lbs (2,313 kg) of cargo, crew supplies, and experiments to the station’s Expedition 48 crew. The mission has been delayed for a variety of causes and was nearly pushed back again due to the pass of Hurricane Nicole over Bermuda on October 13. Bermuda is the location of a critical radar tracking station that would have monitored the mission as Antares pushed its payload out of Earth’s atmosphere. These were just some of the obstacles that the launch team had to work to overcome in order to get the company’s sixth successful resupply run to the ISS underway. 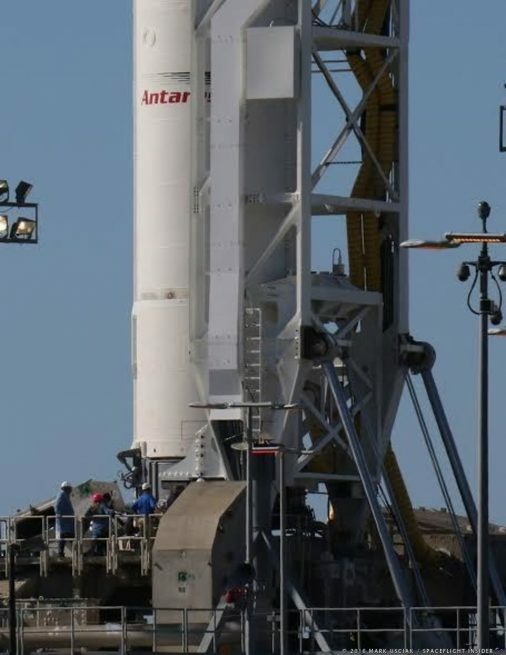 Similarly to how SpaceX has upgraded its Falcon 9 family, Orbital ATK has evolved the Antares booster on each successive flight (Antares has evolved from the 110, 120 and 130 configurations to the 230). The Dulles, Virginia-based aerospace firm was already in the process of progressing to the Antares 230 when they were dealt a setback, (to the AJ26 rocket engines that earlier versions of the design employed). 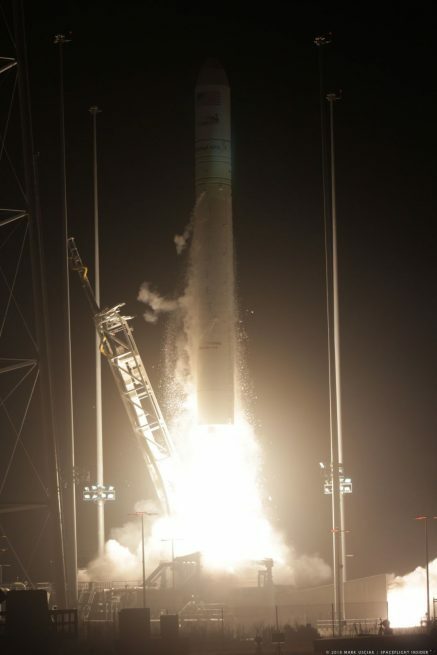 On Oct. 28, 2014, the Orb-3 Antares/Cygnus was lost approximately 12 seconds into flight. The conflagration caused Orbital ATK to conduct the two flights after the Orb-3 accident on United Launch Alliance (ULA) Atlas V 401 rockets from Cape Canaveral Air Force Station’s Space Launch Complex 41 in Florida. The Antares 230 eschews Aerojet Rocketdyne’s 40-odd years old Russian-built AJ26 (NK-33) engines for the modern RD-181. Moving to these new engines appears to be a wise move as it was determined that a turbopump in one of the two AJ26 engines that powered the Orb-3 mission on its 12-second flight had caused the loss of the Antares 130 rocket, the Cygnus spacecraft it carried, and caused extensive damage to Pad 0A. Aerojet Rocketdyne settled with Orbital ATK to the tune of $50 million and also agreed to purchase back the remaining 10 AJ26 engines it had sold to Orbital ATK. With this issue behind them, Orbital ATK has been working to return Antares to service. Although there have been several delays due in large part to the needs of the customer (NASA), a technical issue with the rocket caused the launch to slide 24 hours to Oct. 14 – which placed it square in the sights of what was, at the time, Tropical Storm Nicole. Upon review, the NASA range opted to push the flight to no-earlier-than Sunday, October 16. This allowed the agency to look at what damage Hurricane Nicole had caused. As it turned out, minimal harm had befallen the station and the countdown continued. On October 16, Orbital ATK postponed the flight 24 hours due to a ground support equipment cable not performing as expected during the pre-launch check out. Once the countdown reached zero, the two Russian-built RD-181 engines ignited and powered up to full throttle. About 3.6 seconds later, the launch latches released and the Antares 230 lifted skyward, lighting up the dark Virginia skies and leaping off the pad at an impressive rate of speed, the booster screeching out its defiance of gravity as it scorched a trail skyward. After burning for about three-and-a-half minutes, the RD-181 engines cut out as planned and the first stage separated. At this point, the vehicle was 65 miles (104 kilometers) in altitude, traveling at 8,254 mph (13,284 km/h). The vehicle then coasted uphill for about 35 seconds before the fairing separated. Five seconds later, the interstage separated, clearing away from the Cygnus and the Castor 30XL solid motor second stage. Seven seconds after that, the solid motor ignited and burned for about three-and-a-half minutes. Seven minutes, 5 seconds into the flight, the Castor 30XL motor burned out as expected. At this point, Cygnus was successfully placed into orbit – albeit in a slightly higher orbit than planned. Two minutes later, the cargo ship separated and moved away from the Antares second stage. After an orbit of checking Cygnus’ onboard systems, it was finally time to deploy the two UltraFlex solar arrays. It took about 15 minutes for both to unfurl. With an appearance of a soda can that had suddenly sprouted two large ears, the spacecraft was ready to make its way to the orbiting lab. If everything continues as it is currently planned, the S.S. Alan Poindexter is expected to arrive at the ISS on Sunday, Oct. 23. Upon being berthed to the station, the crew on board will carry out a series of checks to ensure the seal between the spacecraft and the station is tight before entering the vessel (the crew should be able to enter Cygnus about 25 hours after Cygnus arrives at the ISS). The reason for the gap (between launch and Cygnus’ arrival) is to allow time for three new members of the Expedition 49 to launch in their Soyuz MS-02 spacecraft. They are scheduled to arrive at the ISS after 34 orbits, docking sometime on Friday. That will also give the crew a couple of days to get settled before Cygnus rendezvous with the outpost. Once it has arrived at the ISS, the crew will utilize the robotic Canadarm2 to grab the cargo ship once it gets to a distance of about 33 feet (10 meters). Then teams on the ground will take control of the arm and move Cygnus to just below the Unity module and berth it to the Earth-facing port. “Tonight’s launch was very significant to the crew on board the International Space Station, because not only will this cargo module bring them food, clothing, and spare parts for the system on board the space station, but, most importantly, science experiments so that they can continue the fantastic work they’re doing in a laboratory that is traveling 17,500 miles per hour over the Earth,” Kay Hire, a NASA astronaut on hand to witness tonight’s launch told SpaceFlight Insider. The four-time space shuttle veteran also noted the importance of having an array of partners providing services to accomplish space exploration objectives. “It’s great to see launches to the International Space Station happening again from the Virginia coast – and it shows what can be accomplished with a close partnership of federal and state agencies, along with the U.S. industry, all working together,” Bolden said via an agency-issued release. This article is a collaborative effort between Bart Leahy, Derek Richardson, and Jason Rhian; it has been edited as of 5:00 p.m. EDT / 21:00 GMT to provide more and current information. > The Antares 230 eschews Aerojet Rocketdyne’s 40-year-old AJ26 engines for the modern RD-181. Well, RD-181 is a modification of the 30-year-old RD-170 engine. It took a long time, but it is a huge relief that this launch system is finally back in operation. New Space needs two clear competing, reasonably priced choices in launchers to form the base of the upcoming orbital resupply industry.